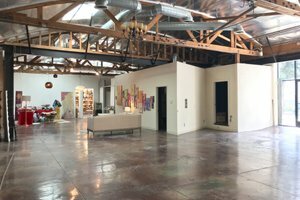 Flexible space that is perfect for a pop-up shop, meeting space, gallery space or art show. 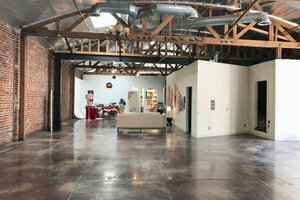 Brick walls, concrete floors, and the bow and truss architecture give this unique space character, and skylights, a large glass door entrance and and 10 ft high windows provide great natural light throughout the day. The space can be dressed up or down depending on the type of look you are trying to achieve. 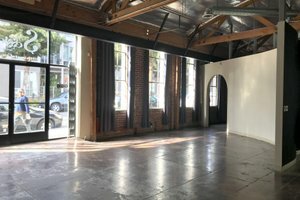 There are two areas at the north end of the building that are hidden from plain view from the main area that can be used as a staging, prep, or stock area. A separate changing/fitting room is also available at the north end of the building. Electrical outlets are plentiful in the wall and also drop down from the trusses above. 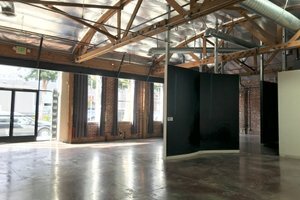 At the south end of the building is a cyclorama wall that can be used for photoshoots. 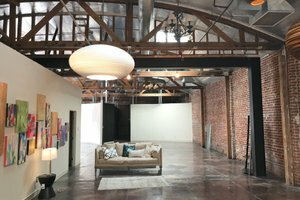 The photo studio is perfect for for models, photographers, makeup artists.